Where to find Paradise hotels near an airport? How can I find hotels in different Paradise neighborhoods? Where can I find hotels in Paradise that are near tourist attractions? If you are trying to decide where to base yourself in Paradise, there is a great assortment of options. Expedia's comprehensive database features 184 hotels within a 0.1-kilometre (0.06-mile) distance of Paradise's downtown. If you are planning to book accommodation that is just easy walking distance of the Paradise city center, Wyndham Grand Desert and Bluegreen Vacations Club 36, Ascend Resort Collection would be perfect. Paradise offers a solid selection of economical hotel and apartment options that will be sure to please budget-minded travelers. 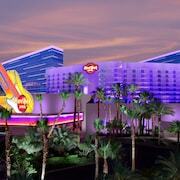 4 kilometres (3 miles) from Paradise's downtown is where you'll find the Planet Hollywood Resort & Casino. The Holiday Inn Express Las Vegas South is just 4 kilometres (3 miles) away. The Hyatt Place Las Vegas and the Palms Place Hotel and Spa at the Palms Las Vegas are some alternative budget places that you could investigate. 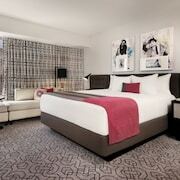 3 kilometres (2 miles) from the heart of Paradise, is the The SKYLOFTS at MGM Grand. 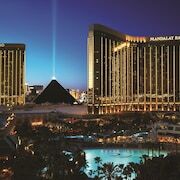 Alternatively, the Four Seasons Hotel Las Vegas can be found 3 kilometres (2 miles) away. 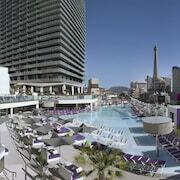 You could also choose to book a bed at the Mandarin Oriental, Las Vegas or the Nobu Hotel. Why not see more of the desert landscapes that are common in Clark County - Las Vegas? 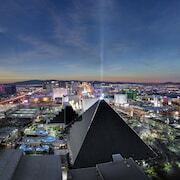 Opt to spend a few extra nights in other parts of Clark County - Las Vegas. Spend time mountain biking or make a trip to the region's tourist attractions. Comfortable hotels are available. Spring Valley is 12 kilometres (7 miles) to the west of Paradise and is home to the Putt Park Miniature Golf Course and Spanish Trail Country Club. Should you wish to spend a night or two in Spring Valley, be sure to check out the Holiday Inn Express Hotel & Suites Las Vegas I-215 S Beltway and The Cliffs at Peace Canyon. 6 kilometres (4 miles) to the south of Paradise, you can also stay at South of The Strip, which is home to the Tahiti Village Resort & Spa and Hilton Garden Inn Las Vegas Strip South. The South Point Bowling Center and Casino at South Point Hotel are a couple of the popular points of interest to experience when you're in South of The Strip. 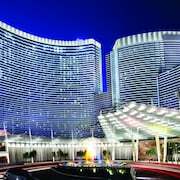 For those travelers planning on arriving through McCarran International Airport, you can book a room at The Cosmopolitan Of Las Vegas, or Encore at Wynn Las Vegas, both of which are a short taxi ride away. What are the most popular Paradise hotels? Are there hotels in other cities near Paradise? What other types of accommodations are available in Paradise? Explore Paradise with Expedia.ca’s Travel Guides to find the best flights, cars, holiday packages and more!